A Tropical Greenhouse will take Fertilizer and will give you tropical foods, or foods that there are no seeds for. Version 2 no longer requires CC to use. It is standalone. Made standalone, so CC is not required. i realize some are busy setting up the new site. much appreciated as well. can someone overhaul this mod??? the production is too low. i wish the texture could b redone as well,mayb a semi-opague glass with plants growing inside?? also what about a version that propagates seeds instead of fruits?? say the local wild seeds: apples,wild onion,various beries,roots,herbs,etc. takes bonemeal n gives a new seed set every 2 or 3 yrs. would give u a way to go from just gathering n hunting to growing wild crops b4 u are ready to trade. As far as I know, there isn't a mechanism in the game to generate Crop Seeds in any way other than the trader. I couldn't get it to be semi-opaque. I tried. It's possible I was just doing it wrong, but I couldn't figure out a way to do it. I may look at it again in the future. I can also take a look at the production numbers and see what's up. thank u. also couldnt it b set as a trader as u said but "exchange" bone meal for various seeds ?? similar mechanics as RED'S train mod?? only problem i forsee would b setting it to only give certain seeds instead of all seeds. rather it would allow u to b specific as to which seeds to allow it to develop. That's not really how it works. The train mod just says "input coins, output item". The crop seeds aren't an item. You can't tell any building to make them. The only way to get them is from a trading boat at the trading post, because there's special code that we can't see that let's them carry them. 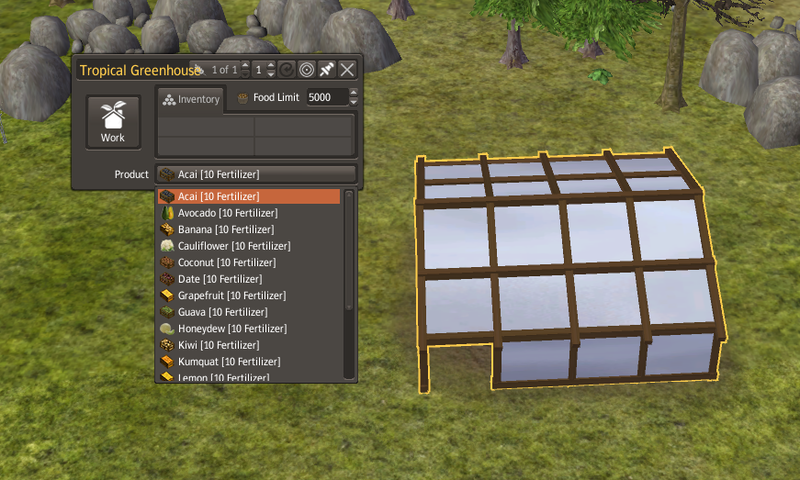 we can control the cost of the seeds then we could make a "trade post" look like a greenhouse. then it would "trade" bonemeal for seeds. if we could limit the type of seeds better yet. we can change terminology and fake the program but the results would b the same. whats a mini-hunter produce in bonemeal per year? multiply by 3 anda worker at a GH "trades" that amount for a seed automatically.or mayb a seed and 250 berries or something. just so later in game it would still have a function. is this going to be upated with the 1.07? Ideas - maybe benemeal - as a valuable waste to sell with a higher value of 2.3 4.5? - that way it will pay off - a small profit - the same with Feathers? I do not know if this is a good idea, I'm choking on your opinions @ Kralyerg, @Redketchup. Cheers! we need a composter to get rid of feathers and bonemeal and get fertilizer. thing is this exchanges 1 item for another. you can make survival coats with reeds from the dock set.or just trade them away to get them our of the barns. when you said you have CC above the RK and were using the TG,did you have the TG between the 2 big mods? the conflict might have been with the greenhouses from the RK. have you tried TOM's patch to get rid of feathers for the North mod? it might work without the North and be a work around. bonemeal is used by the apothecary.